The success of 2017’s Eternal Love <三生三世十里桃花> has not only brought upon more popularity and relevance to Yang Mi (杨幂), but also to the rest of the cast. 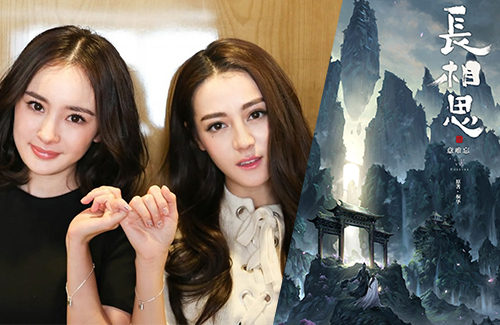 According to financial reports, Yang Mi’s Jaywalk Studio, which also produced Eternal Love, profited 5 billion yuan from the fantasy epic, marking Jaywalk Studio as a rising force in the Chinese entertainment business. Allegedly, Jaywalk Studio’s next big epic will be a TV adaptation of Tong Hua’s (桐华) fantasy romance novel Lost You Forever or Chang Xiang Si <长相思>, the sequel to Once Promised <曾许诺>, which was adapted into the 2017 drama A Life Time Love <上古情歌>. Yang Mi reportedly purchased the Lost You Forever’s adaptation rights for 8 million yuan, and she is pushing Dilireba (迪丽热巴), one of her studio’s main artists, to star as the main lead. Lost You Forever is about the life of Xiaoyou and her love story with Du Shanjing, who she is destined to be parted one day. Due to the popularity and trendiness of intellectual property (IP) dramas—television series that are based on original material or concepts—the public is keeping a close watch on Lost You Forever. So far, fans have not been very pleased about the rumored casting of Dilireba, who fans say don’t resemble Lost You Forever’s main lead. Quite a few TV-goers said they would rather watch Yang Mi taking on the role instead. Jaywalk Studio has not officially confirmed the novel’s production. She is willing to pay big bucks because the novel itself has millions of fans. This drama will be a hit. Famous novel, famous actress…. The novel must be popular.